The latest OPPO smartphone was launched in India last month, and we all know that sooner or later it will be in the Philippine shore. Today, JoshLia, one of the hottest love teams in local entertainment officially introduced the OPPO F7 at ABS-CBN's variety show ASAP. 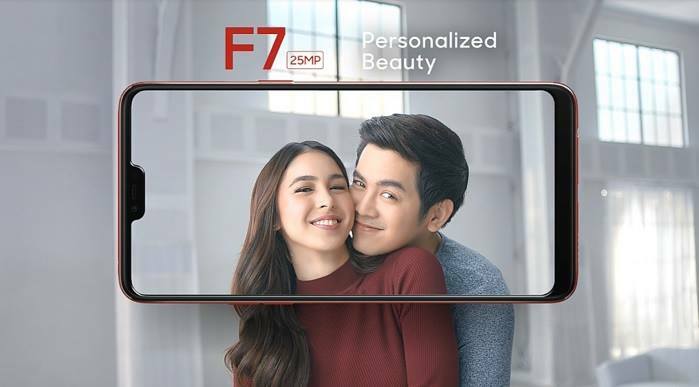 JoshLia, which is the couple name of OPPO Philippines’ endorsers Joshua Garcia and Julia Barretto, highlights the 25MP selfie camera of the OPPO F7. This is the highest megapixels equipped in a front shooter, not only from OPPO phone, but also from other brands, at least that's what we know. This 25MP front facing camera is further enhanced by the improved A.I. Beauty Technology that can detect up to 4 faces and determine their gender in order to deliver unique beautification in each person. Moreover, the said artificial intelligence creates similar adjustments based on the user's preferences. In addition, both the front and main camera have real-time hardware HDR Technology. “The OPPO F7 is our latest offering to our customers, we continue to change the selfie smartphone industry with our ground-breaking technologies such as the A.I. Beauty Technology. With our highest front facing 25MP Selfie Camera, improved performance, screen, and a body to admire, the OPPO F7 will surely be a hit just like any other F series models.” said Eason de Guzman, OPPO Philippines’ Public Relations Manager. Aside from the photography department, OPPO F7 also takes pride of its 6.23-inch display with 19:9 aspect ratio and Full HD+ resolution. It also boasts a 12nm MediaTek Helio P60 chipset that has an octa core processor, Mali-G72MP3 GPU, and dedicated A.I. chip, paired with 4GB of RAM and 64GB of internal storage. The OPPO F7 will be available nationwide for Php17,990 this coming April 21, 2018.